The book is intended to provide in-depth reviews of the recent advances in major areas of metabolism in growing domestic animals. The study of metabolism represents a nexus of biological phenomenon that integrates the impact of nutrition, physiology, endocrinology, immunology, biochemistry, and cell biology in an organism. The development of new methodological techniques and experimental approaches have provide scientists with a greater understanding of how key nutrients or substrates are metabolized at the cellular, organ, and whole animal level. This book presents contributions from leading scientists in nutrition and physiology that highlight important new developments in interorgan and tissue-specific metabolism of protein and amino acids, lipids and fatty acids, and carbohydrates in monogastric and runinant species. Authors will describe the impact of specific biochemical pathways and expression of critical enzymes, routes of nutrient or substrate input, and anatomical or structural influences on the rates of metabolism in a given tissue or cell type. Major substrates/ fuels for oxidative metabolism, key signaling pathways, and intracellular molecules that regulate the major metabolic processes will be described. Also included is how the metabolism of growing animals is influenced by ontogeny, stage of differentiation, and major changes in diet, or the environment. The concepts and specific findings in each area are discussed in the context of their impact on the nutrient requirements, growth, environmental impact, healt and well-being of animals. 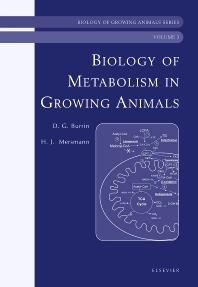 The book will be a useful reference for research scientists, teachers and students interested in and advanced understanding of metabolism in growing animals. The book is written by leading experts and highlights some of the most recent advances in the field of metabolism. It is a useful reference for researchers and advanced level graduate students in nutrition, physiology and animal science. Presents recent advances in the field of metabolism.